Obverse: Portrait of Sofia Helin (born in 1972), a Swedish actress, and as Saga Norén in the Danish & Swedish co-produced TV series "The Bridge". Three Crowns (Tre Kronor) shield, a national emblem of Sweden, as a clear window. Reverse: Geese in flight. Øresund (Öresund) bridge between Sweden and Denmark. Signature: None. Dominant colour: Peach yellow. Security features: Running serial number on the obverse of the commemorative note. Clear windows using the animation called "linear zoetrope". Printing method: Offset. Date: 2016. Date of print: 20 November 2017. Artist: Matej Gabri. Material: Polymer substrate. Printer: Undisclosed. Total production: 1000 notes. numbers, signatures, dates etc. may vary, or this may be our Museum's Gallery item (some gallery items may not be available for sale). Texts: Sverige. 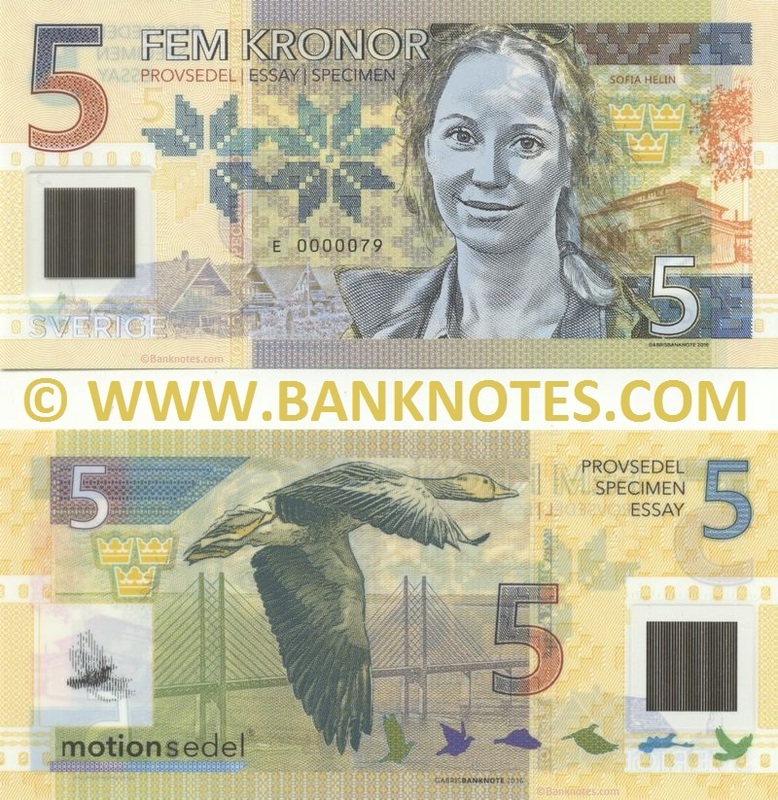 Fem Kronor. Five Kronor (Crowns). Provsedel. Essay. Specimen. Motionsedel.